Fox supplies food-grade, hygienic, clean-in-place (CIP) slurry eductors to the food, personal care, and pharmaceutical industries. They are used when rapid clean out between product runs must be quick and effective to eliminate cross contamination. Fox CIP slurry jet pumps have highly polished and ground internals and are widely installed in dairy, beverage, brewery, and crystallization applications. Below is a fully sanitary eductor in use at a pharmaceutical plant. Fox supplied the pump, washdown hopper and remotely actuated ball valve. A food-grade, Clean-in-Place Fox Slurry Eductor is used in the production of calcium-enriched orange juice. Calcium Citrate is accurately dosed by a feeder while being fed into a juice-driven, food-grade slurry eductor with Tri-Clamp ends. This eductor has been in service for over ten years with no maintenance. Here a dairy manufacturer needed to continuously blend pulverized coconut meat, whey,and flavorings into milk on its way to an interim process. The motive nozzle in the slurry eductor maintains the milk at a fixed, constant flow rate, enabling three loss-in-weight feeders to drop additives into the washdown hopper at a constant feed rate, producingthe desired mixture with uniform solids/liquids ratio. 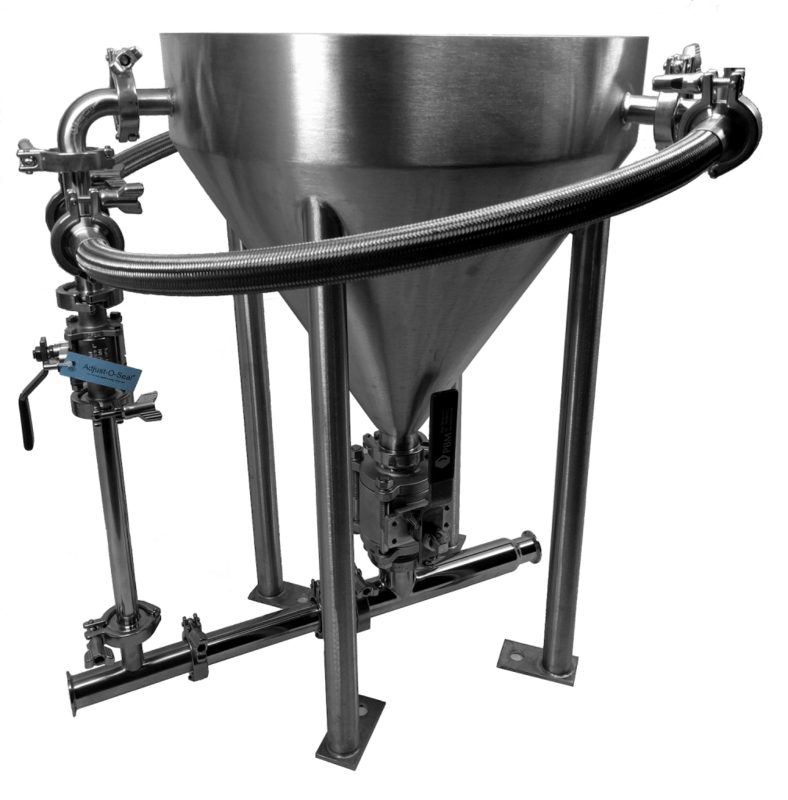 A food-grade, USDA-approved slurry eductor, including pump, washdown hopper and remotely actuated ball valve.